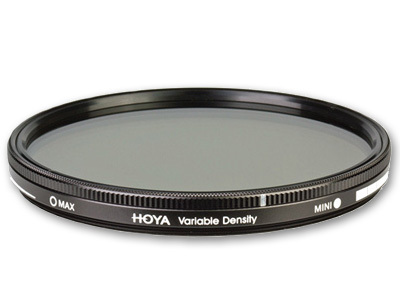 The Hoya 77mm Variable Neutral Density Filter is a solid variable neutral density filter providing an exposure reduction of about 1.5 to 9 stops. The 0.45 to 2.7 density creates a darkening of the entire image, allowing you to photograph with a wider aperture or slower shutter speed than would normally be required. The degree of density is easily controlled by rotating the front filter ring, helping you to predetermine the additional exposure length required. By slowing your exposure time or increasing your aperture, you are able to control depth of field and convey movement more easily. This filter is constructed from optical glass to maintain image clarity and is set within a slim profile aluminum ring, which helps to reduce the likelihood of vignetting when used on wide-angle lenses, and does not feature front threads.